How a children’s book can help cope with loss. A grandfather’s creative solution to his family’s grief. Schotzie’s Father, Scotzie, and Schotzie’s Mother in Doggie Heaven, illustrated by Scott Spinks. Everyone at some point goes through trauma; whether it’s the death of a family member, death of a pet, or divorce, etc. Children, in particular, are extremely vulnerable to trauma. Experiences they face in their youth can have a negative lasting impact if left untreated. His diverse life experiences have given him in depth understanding of some of the world’s greatest challenges and in 2007 Gerry started The Sprayregen Foundation, which among other projects, supplies books to every child who spends at least one night in one of 57 hospitals in the United States. The foundation also creates documentary films on meaningful subjects of universal interest. The foundation is now beginning to build homes for homeless school children in Florida, something which Gerry intends to expand. Recently, I sat down with Gerry to discuss the the importance of an experience which everyone has at least once in their life; death. Schotzie’s Letters from Doggie Heaven is a story told from the point of view of a family dog named Schotzie, who is writing letters to the four children in the home he was living in, about the wonderful new life he has in doggie heaven. Gerry explains that he saw first hand the agony of his grandchildren after their beloved Schotzie was run over by a car. When Schotzie passed away, the family stopped existing as a family; the kids even stopped going to school. The grieving children could not rationalize why the world had taken Schotzie from them and Gerry decided that it was up to him, their grandfather, to try and resolve this dilemma. He came up with an idea and found himself at FAO Schwartz, buying exact replica stuffed animals to Schotzie. He purchased four, one for each grandchild in that family, and then sent each child the stuffed animal. He also sent each child a letter written by Schotzie who explained his fantastic new happy life in doggie heaven. At the same time, he told them he misses and loves them very much, and wants to stay in contact by sending photos and letters. In doggie heaven, everything is free! Schotzie has a brand new house with a slide that goes straight into a pool. There are soda fountains pouring out of the trees and 27 free ice cream locations throughout the park. He gets to bark as much as he wants in the park and he even has a cute girlfriend. He told them about how great it was to live next door to his sister and how awesome it was to see his parents again. During one exciting moment, he played basketball against Michael Jordan’s pooch and faked him out of his shoes…double wow! The letter’s effect on the kids was Immediate. Not only were the kids not sad, they were thrilled that Schotzie was so happy and healthy in doggie heaven, and life was perfect again. Years later, Gerry turned the story of Schotzie into a children’s book. Through the book, Gerry beautifully captures the emotions of not just his grandchildren, but what all people in the world go through surrounding death. Every day there are countless children that lose pets who they love. This book takes a horrible event and creates a story of love and devotion! It is my mission, for my friend Gerry, to tell his story on a larger scale and to shine a light on a problem that we all face but are not sure how to cope with it. 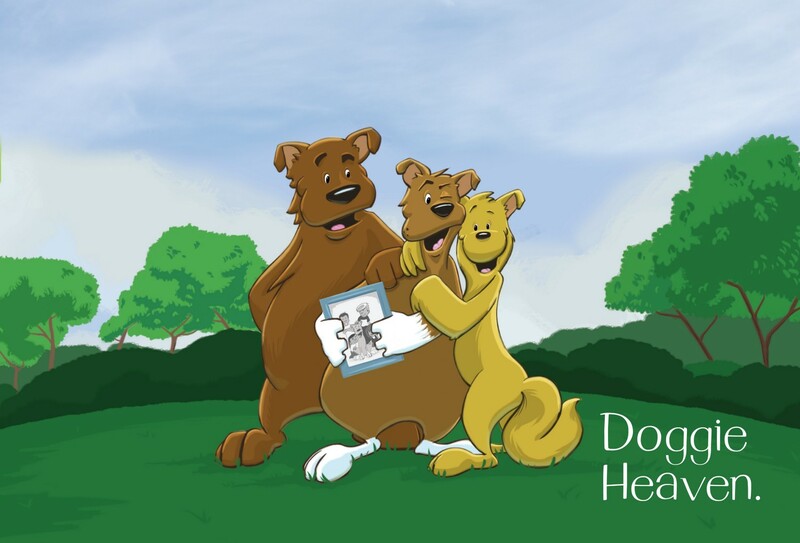 I highly recommend Schotzie’s Letters from Doggie Heaven for every child who loses a pet!